Nicolas Heller has been getting his hair cut at Astor Place Hairstylists since he was a kid. Heller, a filmmaker (aka New York Nico), had never talked with Michael Saviello, better known as Big Mike, the shop's manager for nearly 40 years. About a year ago, Heller used the restroom there, and spotted Big Mike in the storage area — painting. "I had to hear what his deal was after that," Heller says with a laugh. The end result is "Big Mike Takes Lunch,” Heller's documentary that captures a day in the life of the longtime manager at Astor Place Hairstylists, which opened in 1947 at 2 Astor Place at Broadway. For the past year, Big Mike has spent his lunch break painting, an activity that he hasn’t done since high school. Per the documentary's description: "Follow Mike as he takes you on a journey through his shop full of characters and the storage unit he’s turned into his personal art studio." In conjunction with the screening of the film, Big Mike will be having his first-ever art show at Astor Place Hairstylists on Saturday night at 8:30. 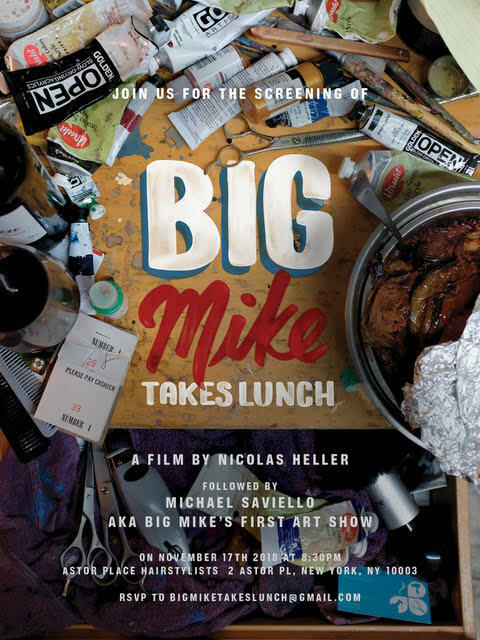 RSVP to BigMikeTakesLunch@gmail.com. if you want to attend. I love it; he has real talent! Keep up the good work, Mike! Talented gifted congrats you deserve it !!! What a lovely 12 minutes !! Thank you Mr. Heller. Me and my Polish girlfriend (who got her hair cut at the shop on her only trip to NYC) enjoyed the video.